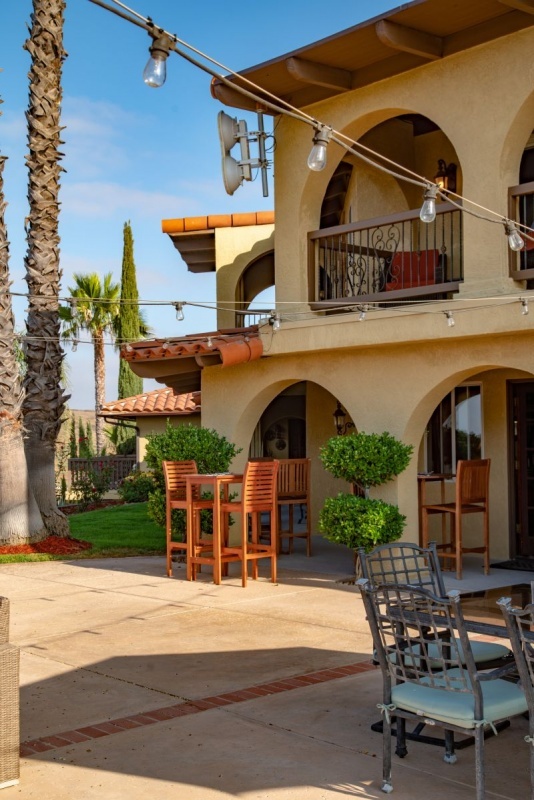 We had the opportunity to stay at the charming Inn at Europa Village when we were visiting beautiful Temecula wine country. What an unexpected pleasure that was! 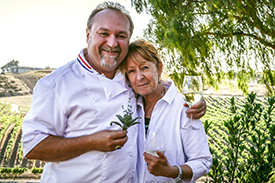 Chef Dean Thomas with his wife Nichole. Photo courtesy of The Inn at Europa Village. We were greeted by our host, Chef Dean Thomas as we checked in. His warmth and personality really put us at ease. He explained the Inn and all of the little extras he provides for his guests who stay. Homemade sangria with fruits from his garden is just one of the surprising and delicious treats he had in store for us. 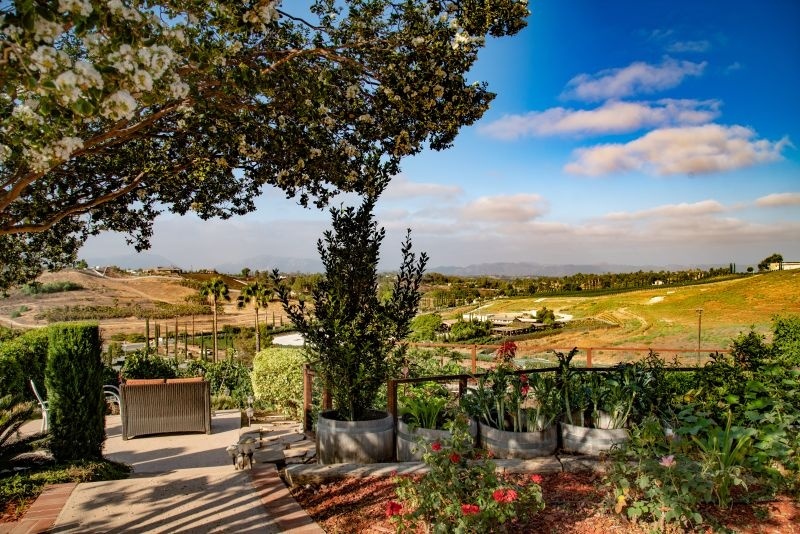 The inn is located on a hill and has absolutely amazing views down over the valley of Temecula below. It is a steep trek up the road leading to the inn, but it is well worth it once you get there. The inn itself is small (only 10 rooms) and the architecture is Mediterranean in style. 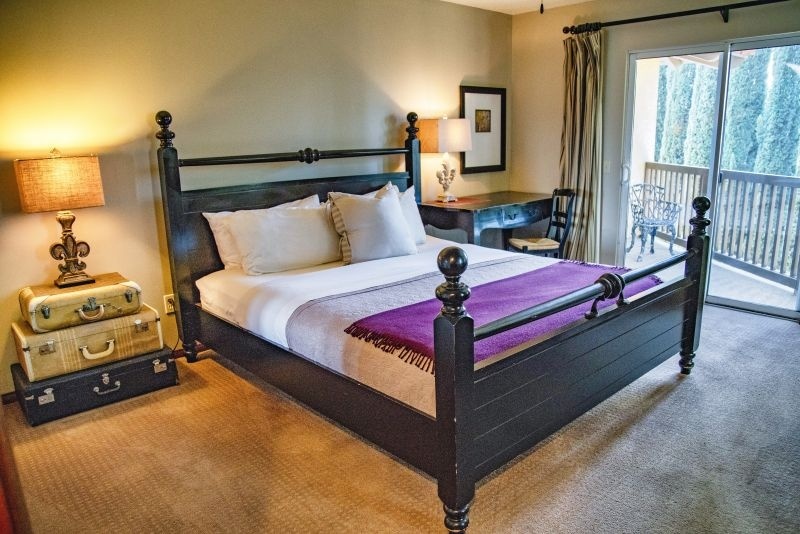 The rooms are all spacious and comfortable with heavy furnishings that add to the charm and character of the place. Our bathroom had a jacuzzi bathtub so we could soak and relax after our hard day of wine tasting. 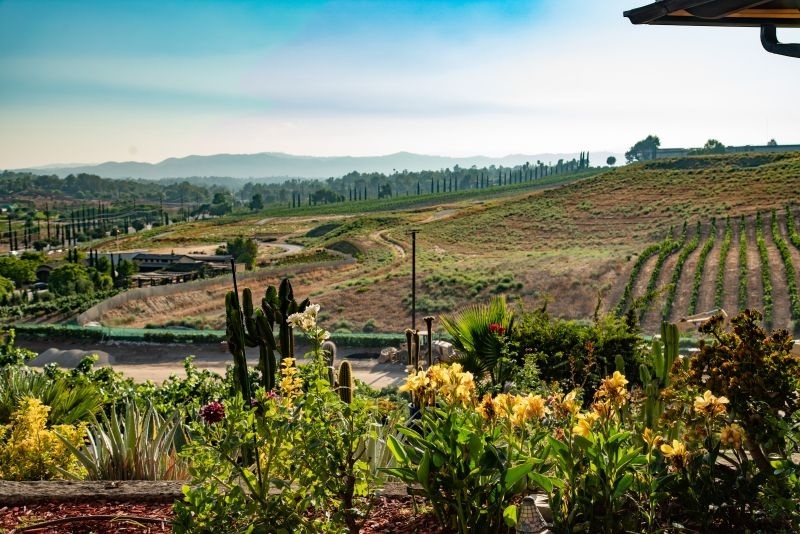 Check out our tasting at Palumbo Family Vineyards and Winery in our post Here. The communal living room area at the Inn at Europa Village which was a great place to enjoy the homemade sangria. 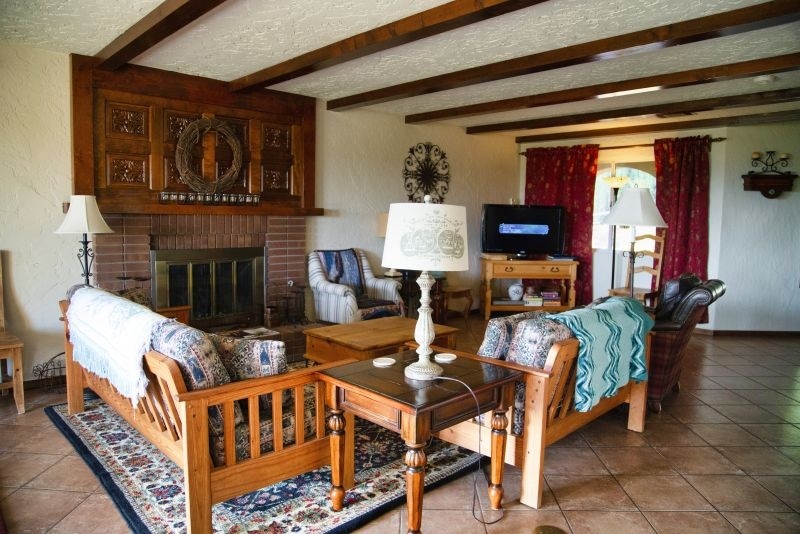 The communal living room space at the Inn was warm and inviting to sit and sip the sangria. We took advantage of that and met with our friend Jimmy of JimmyFu-tography. He’s my photography hero, and is local and well known in Temecula. Afternoon view from the patio. 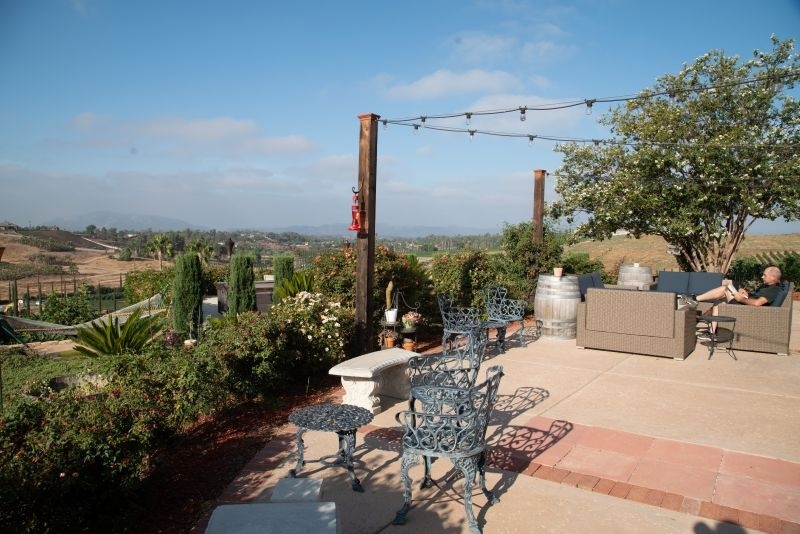 A great place to relax and enjoy the fresh air at the Inn at Europa Village. We were exhausted after a long day of tasting wines. (Check out our wine tasting post at Doffo Wines.) Believe it or not, it is hard work and we were ready to just relax in our room and go to sleep. Our bed was so comfortable, and the air conditioner worked to the perfect temperature to help us drift off into a dreamless sleep. We awoke, feeling rested and rejuvenated. Sitting on the patio waiting for breakfast to begin. Chef Dean had quite the feast ready for us! We were told by Chef Dean that our breakfast would be special, but he undersold it. 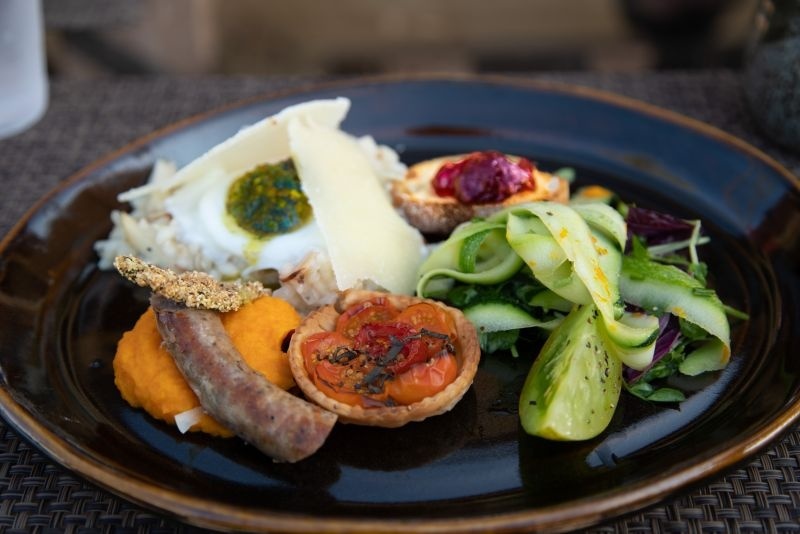 We have traveled all over and have stayed at Gourmet Bed and Breakfasts and the finest hotels but I think this was one of the top gourmet breakfast experiences we have had. This was not your typical fare by far. Breakfast was a chef lead meal which made it all that more special. Everyone staying at the inn sat down and were served together as Chef Dean explained each course and which elements came from his own garden. Gourmet fruit cup from the Inn at Europa Village. The flavors were amazing – and the presentation was first rate. 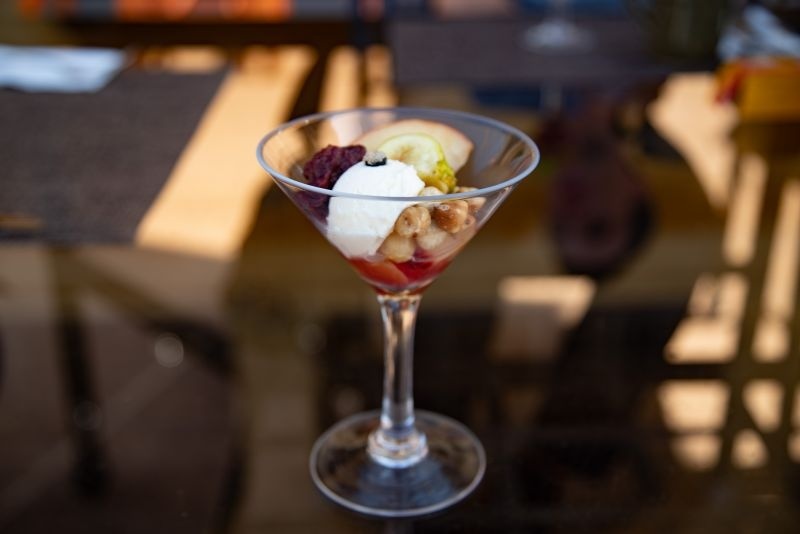 Our first course was a beautifully presented fruit cup that was accented with alcohol, toasted hazelnuts and a white creamy cheese that reminded me of mascarpone. The combination of flavors and textures had my taste buds singing. In my opinion, the toasted hazelnuts were genius with this dish as it added crunch and dimension. Amazing breakfast at the Inn at Europa Village. The stay was worth it just for this! The main course was quite the plate. A combination of flavors and textures made it unique and tasty. The plate started out with a poached egg with pesto which rested on top of apple risotto. Shavings of Parmesan were tented over the top. Just below that sat a carrot and ginger puree with a homemade sausage accented by a fried and breaded leaf of basil which was also a delicious combination. The plate also held a mini tomato tart and I have to say, I wished my whole meal was just more of that it was so outstanding! On the side, there was a salad of green tomato slices and zucchini shavings and finally a crostini with homemade jam. Together it was a feast for the eyes and the taste buds. Sadly our time was short due to our schedule as I would have liked to lounge and linger before checking out. We so enjoyed our stay at the Inn and loved our breakfast with Chef Dean. 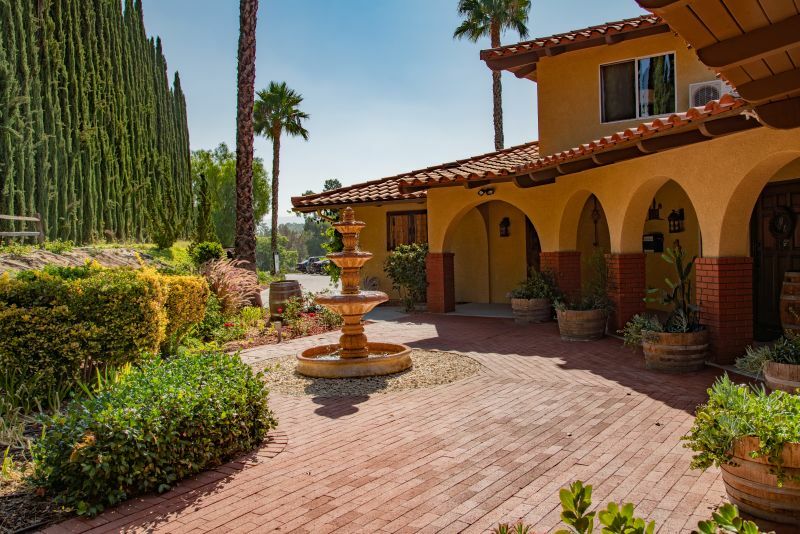 If you are looking for comfort, great food, and a personal touch during your visit to Temecula, The Inn at Europa Village is the place to stay! Looking for similar types of weekend getaways? Check out our friends at Always5Star for travel tips and luxury things to do. *Disclaimer: We were given our stay at the Inn in exchange for a review. All thoughts and opinions are our own. What a charming place. Beautiful views and I love the suitcases as the lamp stand ! I loved that too. I was thinking about recreating that at home. So comfortable and homey, not to mention beautiful! What a special place! Thank you for having a read. I hope you get the opportunity to visit the Inn and Temecula Wine Country. What a lovely place to call home for a few days. It truly was lovely. The food was amazing and unique! What a great place to stay! I will think about this spot when I head to visit Temecula. And you of course! Always great to stay right in the middle of wine country.